Accsense Thermistor Probe Model E1-20 facilitates use ofÂ single Wireless A1-08 Temperature Data Logger to simultaneously monitor up to 6 temperature points. 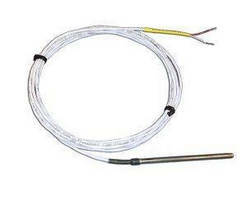 Supplied with 10 ft insulated cable, probes are 2-wire 10 KΩ thermistor assemblies consisting of element encased inÂ 3 Â½Â in. long x 3/16 in. dia stainless steel tubewell filled with high-purity magnesium oxide powder and capped with potting compound. Size of probe sheath facilitates installation. CHESTERLAND OH – CAS DataLoggers is pleased to announce that a new version of our Accsense Thermistor Probe Model E1-20 is now available at a reduced list price of $90.00. This improved version of the probe is more accurate, easier to install and even more affordable! Our thermistor probe makes it easy to use a single Wireless A1-08 Temperature Data Logger to monitor up to six (6) temperature points at once. The new E1-20 sensor is ideal for medical monitoring in multiple refrigerators and freezers (monitoring -20ºC or above) and also ideal for use in other applications such as monitoring stacked incubators, vaccine storage, tissue samples and more. The new temperature probes are 2-wire 10KΩ thermistor assemblies, consisting of an element encased in a 3-1/2” long x 3/16” diameter stainless steel tubewell. This tubewell is filled with high-purity magnesium oxide powder and capped with potting compound. A short length of heat-shrink tubing covers the transition between the tube and cable jacket. The probe comes with a 10 ft insulated cable, and all probes are clearly marked with their Accsense part number. • The list price has been reduced from $139.00 to $90.00. Accsense A1-08 Wireless Temperature Data Loggers are automated temperature monitoring pods that communicate their readings with an Accsense B1-06 Wireless Data Logger Gateway. Each A1-08 data logger can connect to up to 6 E1-20 thermistor temperature sensors to monitor temperature over 6 points, making for cost-effective monitoring and alarming. Designed for measuring temperature at remote sites, Accsense A1-08 data logging pods have a wireless range of 250 feet (90 ft. indoors without obstructions) and can run on either battery or AC power. In the event of a power outage, each unit will keep logging on its 250-sample emergency buffer per sensor. Each A1-08 temperature datalogger also features 2 digital inputs to set up alarming devices. Using the online software, it’s easy for users to configure Accsense to call a list of staff sequentially so facilities never miss an alarm event, even over the weekend. The new probe can also be used with our Accsense A1-02B Wireless Temperature Dataloggers. For more information on the new version of our Accsense E1-20 Thermistor Probe, to learn more about what Accsense Monitoring Systems can do in your application, or to find the ideal solution for your application-specific needs, contact a CAS Data Logger Applications Specialist at (800) 956-4437 or visit the website at www.DataLoggerInc.com.